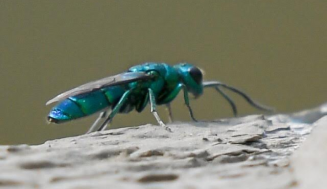 Sweat bee is the name given to a large variety of bees belonging to the same family. These bees are attracted to your sweat and hence the name sweat bees. During the day you can typically encounter them swarming over flowers and carrying yellow pollen back to their nests. If you hang by the pool and notice a number of these, you can be sure of a nest somewhere around. At times, they might change their plans and start hanging around your arms and face, having been lured in by your sweat which they find fascinating. If only being attractive to bees was something you could boast about! What is a sweat bee and how do you identify one? Sweat bees are the most common type of bees that are found all over the world, except for Australia. About a thousand species exist in North America alone. These are usually small and adorn the complete look of a bee, strapped with a sting that they can use in defence. It is hard to differentiate between the various species of sweat bees but colour is usually a distinguishing factor. Sweat bees can be as small as 0.12 inches and as big as 0.4 inches. There is a big range of sizes over which they are found. About a quarter of an inch long is the average size for a female sweat bee. 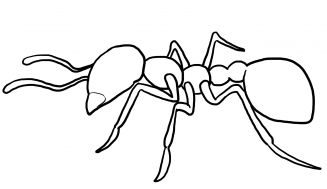 Males usually resemble females of the same species except that they are often more slender. A quick method to identify a sweat bee is to be wary of their metallic appearance. Most of these are dull and dark black in colour. Many species which are partially or completely green have been identified as well. These are usually shiny and brilliantly coloured. 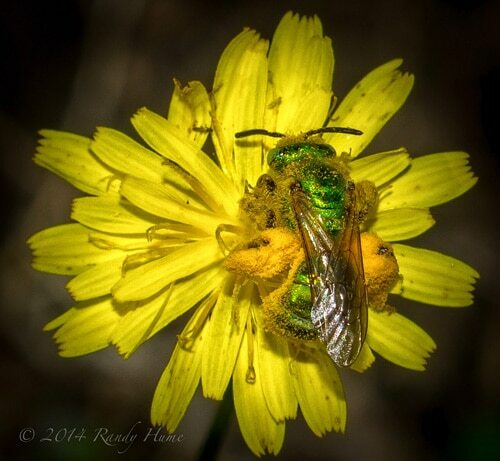 These green bees or green sweat bees are usually longer than other sweat bees. Red, blue and purple coloured sweat bees are not uncommon. Many species of sweat bees have that familiar yellow and black characteristic of the bees. But not all flying menaces that bear this reoccurring colour theme in the flying insect world should be identified as sweat bees. There is a cleverly deceptive fly called the hoverfly which looks like a yellow and black sweat bee. It flies around smugly, looking dangerous. Birds refrain from attacking these because of their appearance, since they know that bees can sting. Hoverflies are the mimics of nature. They even mimic the stinging action of the bees and wasps if you get hold of them. In such a case, hoverflies try to push their abdomen into you. But they do not have any stings and are harmless. The easiest way to tell hoverflies apart from bees and wasps is to notice their wings. Hoverflies have only a single pair of wings while bees and wasps have two pairs. Why do sweat bees love sweat? Sweat bees are attracted to your sweat. Due to their small size, it is easy to miss them when they are flying around you in an effort to land and lap up your sweat dripping down. Our sweat has a fair concentration of salts, the same reason why it tastes bitter. 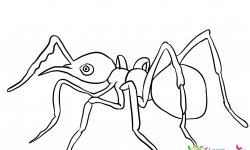 It has been found that the legs of the sweat bees are sensitive to sugar and even more so to salt. Sugar is required by the sweat bees for the purposes of energy and in order to keep working all day long. 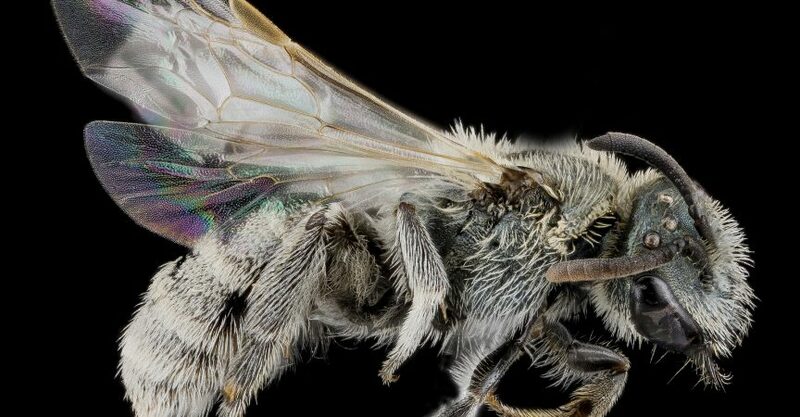 Salt, on the other hand, is required in order to carry out the metabolic activities in sweat bees as well as to carry some back to their nests for the larvae. 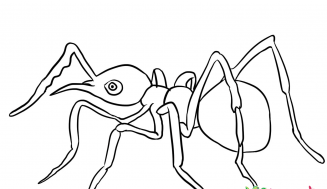 Sweat bees would not have been attracted to our sweat if it did not contain any salt. These days most people are looking to fit saltwater swimming pools in their homes because these eliminate the need for water treatment with chlorine or any other chemical. Saltwater swimming pools attract the sweat bees to these water sources, which have water for hydration as well as the proper concentration of salt that is desired. As a result, many people have been complaining about the abundance of sweat bees around their swimming pools, disrupting their daily lives. Most of the other species of bees make a hive and live in colonies but sweat bees strive to be different even when it comes to housing arrangements. Most of the species of sweat bees make nest in the ground. This is not because sweat bees are humble and down to earth flying insects. The arid regions where they build underground nests contain an adequate amount of alkali. Salt crusts are formed when water leaches from the underground region to the surface of the earth in these areas. If there is a rotting wood available to them, the sweat bees might consider that as a lucrative living option as well. In such cases, the nests built in wood resemble the underground nests. In general, sweat bees do not live in a big common hive. They build a multitude of small nests which are close to each other. They might decide to connect them with each other or not. In case they do, there is usually a single main tunnel through which the sweat bees can enter or leave the nest. The entrance of the tunnels are duly guarded in turns. Will the sweat bees chase and sting me for my sweat? Sweat bees are not aggressive variety of bees. They are more concerned with pollen-collection and nectar-sipping activities rather than biting and stinging random strangers. 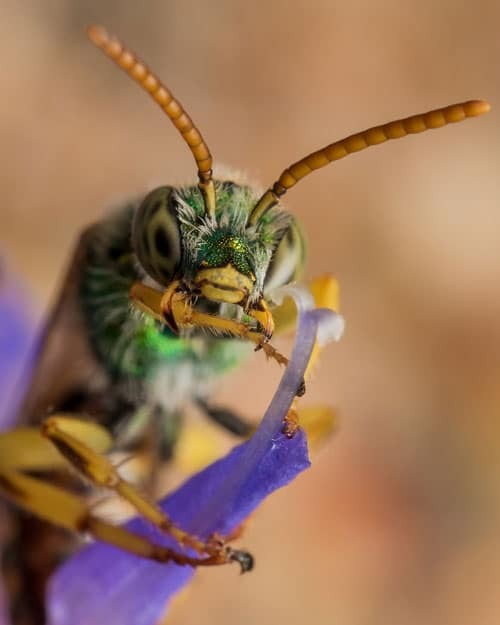 Usually when people encounter a brightly metallic green sweat bee, their first instinct is to panic and swat them away. Sweat bees sting only when provoked and even then they are reluctant. Male sweat bees do not even sting, only pinch or bite our skin. Even if they manage to sting you, the pain from the sting will be almost negligible. However, if you are allergic to pollen or bee stings, then you must take proper care after a sting from a sweat bee. We are all familiar with the social system which the honeybees follow in a hive. There is a division of labour, the nursing group cares for every offspring and a hierarchy is maintained. Queen and selected males take on the responsibility of reproduction, while soldiers and workers maintain the order and living conditions of the hive. Such an organization is called eusociality. But the sweat bees do not follow this typical system of society. Many species of sweat bees are solitary dwellers. They do not wish to live together with other sweat bees in a congregation. The female builds, occupies the nest and takes care of everything from collection of pollen to the security of the nest. This is an example of the behaviour of a sweat bee at the most basic or primitive level. Some species of the sweat bee live communally in an effort to maximize the security. In this case, the nest entrance is shared but the cells are constructed separately by the individual bees. Even when the sweat bees exhibit eusocial behaviour, there is little to no communication between the adult members of the nest. It has also been found that the extent to which the sweat bees are tolerant of each other’s company depends on the time of the year and the current season. Adult sweat bees feed on nectar. They collect nectar and pollen to bring back to their nests where it is stored for the larva. When they live in a eusocial system, every sweat bee collects pollen for each offspring. The female sweat bees are the pollen-collectors in all the species of sweat bees and carry the pollen on their hind legs. These are the ones you might come across travelling back to their nests from a pollen-collection mission. Chances are it might abandon its mission attracted by your sweat so make sure you allow it a wide berth. 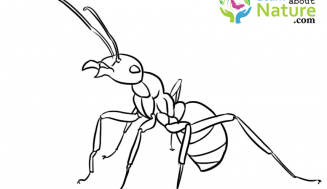 Some species of the sweat bees have been found to be parasitic in nature. In these species, the female invades the nests that have been built by other sweat bees and discreetly lays eggs in the food stored by the host bee. Hosts can be the sweat bees of the same species or those of other species. Not only is this a parasitic behaviour but it is also thievery. The food collected with hard work by the host sweat bee gets stolen by the parasitic bee. This is known as cleptoparasitism. The larva of the sweat bee then kills the egg or the larva of the host bee and consumes all the food collected by the host bee. Alternatively, the larva of the host can be killed by the parasitic sweat bee prior to laying eggs. These parasitic sweat bees do not engage in pollen-collection at all. They also do not need to build nests as they steal the nest materials from other sweat bees and live off that. 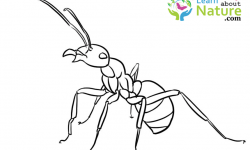 How can I get rid of sweat bees? Sweat bees can become a nuisance, especially to people having a swimming pool or open water faucets in the houses. All kinds of bees need water for hydration and also to keep their nests and hives cool. They carry the water back to their nests and spray the water on the walls of the cells. With the process of evaporation, the heat from the cells is lost. There are various ways to get rid of sweat bees. Some of these involve killing the bees for good while others are non-violent methods. The bees can be simply trapped and released somewhere far away from you. However, trapping is not the best way to collect a bee for domestication. Since all kinds of bees play a major role in pollination, they are crucial for the survival of the ecosystem. If bees disappear from earth, there will be a major ecological shift which will lead to destruction of the natural environment. Thus, you should avoid killing or trapping sweat bees as much as possible. 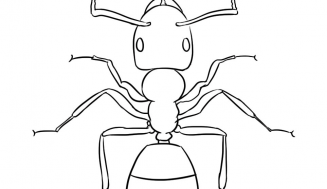 If you are looking for a similar colony-based insect as a pet, you should consider ant farms which are the best way to observe insects in a eusocial environment. Some of the methods suggested to eliminate the sweat bees involve attacking them with a dish soap solution in a sprayer. 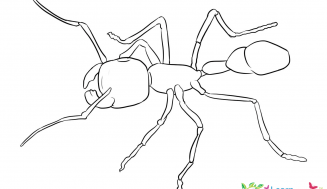 This method is dangerous because the sweat bees can sting you when provoked. A direct confrontation with the sweat bee should be avoided at all costs. Spraying of insecticides and pesticides on their nests is also not smart because this can unite the sweat bees into action against you. The most effective method is to employ a trap which can be lethal or non-lethal. You can make a simple home-made trap to capture sweat bees, hoverflies and even the insidious yellow jackets. For this trap you need an empty 2-litre plastic bottle. Cut the bottle with a pair of scissors at the end of the slant from the mouth in order to obtain a funnel. Invert this funnel and place it over the other half of the bottle. Fix the funnel in place with the help of staples or tape. Now all you need is some bait.